The Angels have the big right arm other clubs have paid for dearly. After making a huge error in 2013 by making Garrett Richards wait while signing free agent Joe Blanton and watching him give up home runs, Richards is getting those starts in 2014, and he's making them count. Angels right-hander Garrett Richards is capitalizing on his first real opportunity in the Angels' pitching rotation this season (EricEnfermero/Creative Commons Attribution-Share Alike 3.0 Unported license). 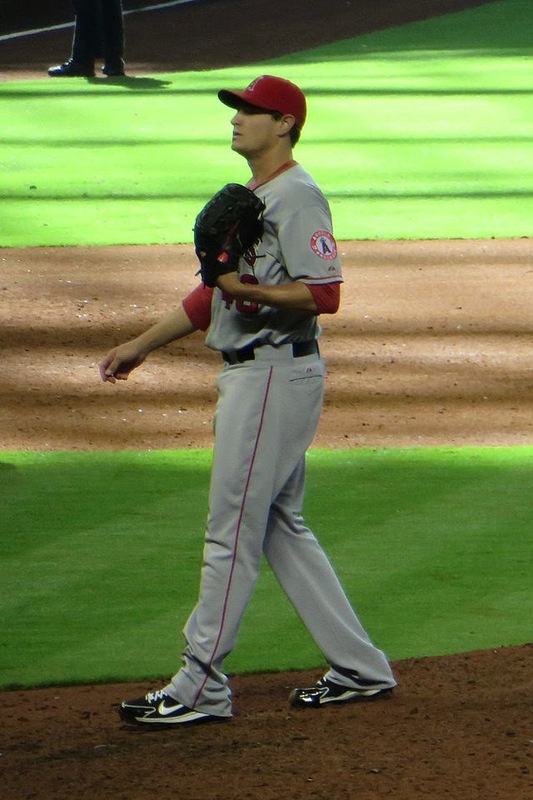 Of all the reasons for the Angels to enter today's games with the second-best record (67-44) in baseball – and there are many – none is so striking as the emergence of Garrett Richards as a big arm in that starting rotation. Time and again, we've seen Richards own his games this season, though none have been better than his five-hit shutout against the Dodgers at Dodger Stadium Monday night. A year ago, the Angels seemed to have no confidence in Richards, their 2009 first-round draft pick from the University of Oklahoma They might have had their reasons, but those reasons weren't good enough. Rather than stick Richards in the rotation and let him try to swim, they thought it would be prudent to sign Joe Blanton for two years at a total of $15 million and give those starts to him. We saw how that turned out. Blanton finished 2-14 with a 6.04 ERA in 2013, allowing two home runs for every nine innings pitched. No Angels starting pitcher has turned in a worse campaign since Jim Abbott's regrettable 1996 season, which ended 2-18 with a 7.18 ERA. While Blanton couldn't keep the ball in the park last year, Abbott just couldn't get the ball over the plate in 1996, walking 4.9 hitters per nine innings. With Blanton taking those starts, the Angels decided to try Richards as a power arm from the bullpen. But relief pitching has never suited Richards. As a reliever, he has taken the ball 55 times in his career, throwing a 4.57 ERA, with hitters hammering out a .736 OPS and a .327 batting average on balls hit in play. In 63 innings as a reliever, he has a WHIP of 1.492. Whether he's better equipped psychologically to be a starting pitcher – we should leave that to a psychologist. But the results are clear. He has taken 52 career starts now, covering 320 1/3 innings with a 3.51 ERA and a 1.223 WHIP with a .281 batting average on balls hit in play. A good portion of those numbers as a starter, of course, are from this season, when he has been a starting pitcher from the beginning. And it isn't just because he's a starter that he's performing so much better. His approach to hitters is improved because he obviously has more confidence in his stuff. That, and his stuff is better. In years past, Richards would enter a game and everything would be hard, everything would be away. We should say everything was relatively hard, because even his slider averages 87.49 miles per hour and his change up averages 89.83, according to Brooks Baseball. Either of those is a pretty good Jered Weaver fastball these days. The key, though, is that he is spotting with greater variety against right-handed hitters and left-handed hitters, and he is throwing those off-speed pitches more often. By the reckoning at Brooks Baseball, Richards is throwing the off-speed pitches 35.82 percent of the time in 2014, compared with 31.53 percent of the time in 2013. Out of every 100 pitches he throws, which basically amounts to a start, Richards is throwing four or five more off-speed pitches than last year. It's a big difference. His control is good, but it certainly isn't better (2.9 walks per nine innings this year against 2.7 last year), and he's striking out 9.0 batters every nine innings (compared with 63 in 2013). But when hitters make contact, it's not as solid. We can see that not just from watching, but also from noting that batting average on balls hit in play against him is down from .308 in 2013 to .258 this season. Along with that, all of his pitches are harder, again, per Brooks Baseball, compared with 2013. His four-seam fastball is up from 95.38 mph to 97.19, his sinker is up from 95.43 to 96.84, his change up is up from 88.71 to 89.83, his slider is up from 86.24 to 87.49, and his curve is up from 78.18 to 79.56. A much more obvious improvement to the naked eye is seen by simply watching how left-handed hitters now encounter Richards, which is not comfortably. He's not afraid to go in on left-handed hitters, and they're not dealing with it. Left-handed hitters are batting .190 with a .516 OPS against him. Last year, those numbers were .281 and .751. Which is to say that Richards is putting it all together. Add it up, and he's 12-4 with a 2.58 ERA this season. Richards, at this moment, has the biggest big right arm – the hardest, at least – of any starting pitcher in the American League. Other clubs have paid deadly to add starting pitchers this season. The Angels gave a chance to a guy who they had lying around. After Monday night's game, Albert Pujols was, in the presence or reporters, putting the name of Garrett Richards in the same breath with the Cy Young Award. One question frequently posed about Richards concerns his durability. He has consistently pitched 145-150 innings in his five full-season years as a professional, and never more than 157. With his five-hit, nine-strikeout performance in a 5-0 win against the Dodgers Monday night, Richards now has worked 153 1/3 innings in 2014. With 51 games remaining in the regular season, Richards stands to take the ball 10 more times before the end of September. Then come the playoffs, when the Angels are certain to depend on him. He's 26 now, well into his professional career, and well past the age when we would expect the Angels to go easy on him. Can Richards put up 10-15 more starts this season and load, maybe, another 100-plus innings onto his arm? Editor's note: All numbers in this piece, except those specifically attributed to Brooks Baseball, are from Baseball-Reference.com.